Former Senator Ferdinand "Bongbong" Marcos Jr. on Monday claimed to have found evidence of fraud to support his election protest against Vice President Leni Robredo. At a press conference in Manila, Marcos said that his camp discovered the alleged proof after they reviewed some of the soft copies of ballot images from clustered precincts in several towns in the pilot provinces of Camarines Sur and Negros Oriental. He said copies of ballot images from Barangay Salvacion in Tigaon, Camarines Sur and barangays Poblacion and Jilocon in Negros Oriental showed that votes for him were not counted and considered undervotes. Marcos said that in some of the ballot images, even though two or more candidates were shaded in the vice presidential race, the votes still went for Robredo instead of being declared overvotes. Marcos also questioned the presence of square shapes in the ballot images instead of the oval shapes which voters shaded for their choice of candidates. “When we voted, we had the oval shapes. How come in the ballot images, the ovals are gone and instead we have the squares. What does this mean?” he said. "We could see based on the election results summary that the squares indicated the candidates that were voted upon. But this is a new feature that the Commission on Elections [Comelec] and Smartmatic added in the system and I had been told they did not inform the candidates of the presence of this feature in the images,” he added. Marcos said that in the previous elections, the ballot images would contain the oval shapes because the images were supposed to be just mirror images of the actual ballots. The Comelec has yet to start the decryption of ballot images from the third pilot province of Iloilo. Marcos concluded that the Comelec and poll technology provider had conspired with Robredo's camp to ensure her victory in the May 2016 election. "The evidence will be the final count in the recount as opposed to the reported count of Comelec and Smartmatic," he said. “We will show more proof as we go through the rest of the printed ballot images. They bastardized our democracy and the sense of honesty and integrity of the Filipino people. 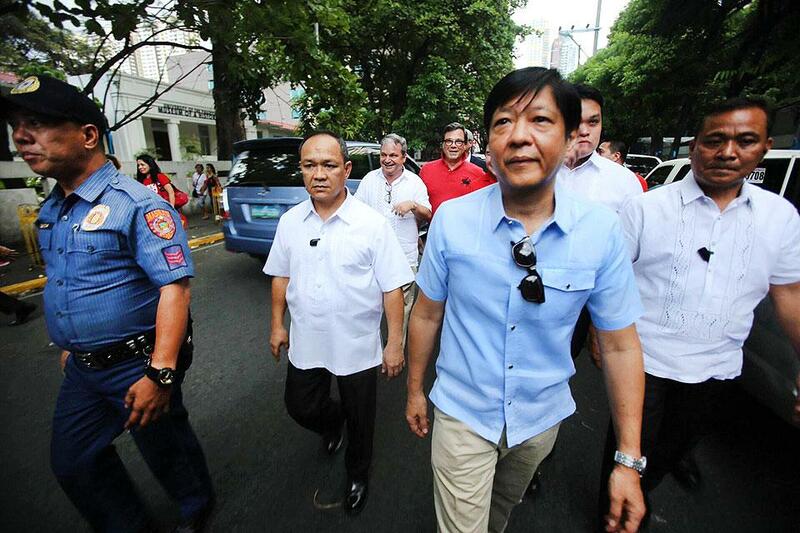 Their depravity is unprecedented,” Marcos said. Marcos also challenged Robredo to withdraw all pending motions before the Supreme Court (SC), sitting as the Presidential Electoral Tribunal (PET), in order for the recount process to begin. "I will withdraw all my motions para wala nang pag-aralan ang korte and we can proceed with the recount,” he said. Robredo's counsel, Romulo Macalintal, earlier said that Marcos' repeated claims of delay are "baseless" and "self-serving" since the former senator is filing "baseless motions and raising pointless issues." "He only has to blame himself for filing a weak and flawed election protest that the Presidential Electoral Tribunal (PET) has to resolve many preliminary matters before the case could move on," Macalintal said in a statement. "It was Marcos who first asked the PET to first resolve the issue of defective election system and his vaunted claim that he would be presenting voluminous documents and evidence to prove his case," he added. Marcos, son of the late dictator Ferdinand Marcos, lost to Robredo by 263,473 votes in the May 2016 election which the former senator claimed was marred by fraud.